This key issue of the Avengers features the origin and second appearance of the enigmatic Vision, who also joins the team in this issue. The offered CGC 9.8 is the highest graded, and is 1 of only 22 - among more than 700 certified examples! 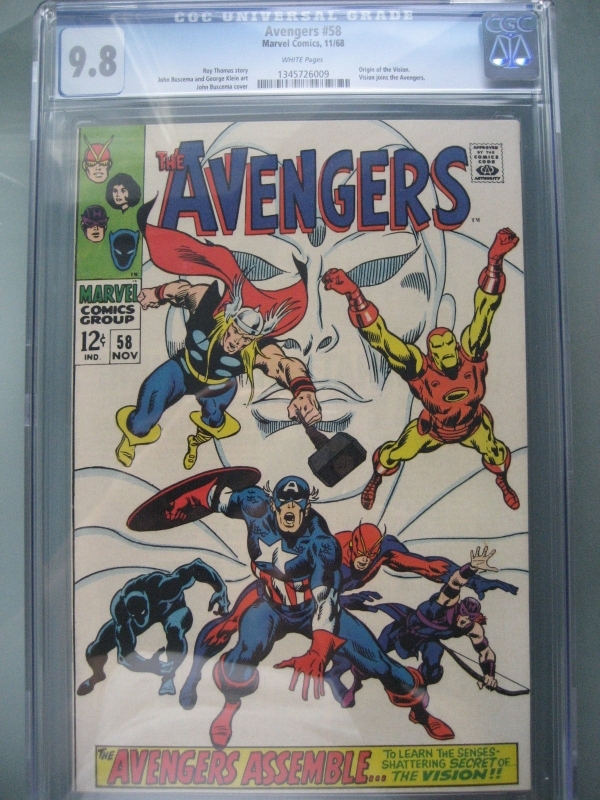 - that have earned CGC's pristine NM/Mint 9.8 grade. And additionally, this book was assigned perfect White Pages, making it the very best 9.8 obtainable. The Vision wishes to become an Avenger, so Captain America, Thor and Iron Man all attack him to test his power. He passes the test and they make him one. Vision remembers he was created by Ultron to kill the Avengers. They go to Goliath's lab and Goliath remembers how he created Ultron, but was attacked by it and made to forget the entire incident. They also notice that Wonder Man's memory tape is also missing and they realize that the Vision is made up of Wonder Man's memory and brain patterns. "Avengers: Infinity War" Movie in Theaters May 4, 2018!